Jonah, links and passages named "undefined"
This is a list of bugs in Twine 1.4.2. Some of these may be carryovers from Twine 1.4.1, and some may be newly introduced. All of these will be fixed in a future release. Due to a bug, the image syntax in 1.4.2 only works with imported image resources - external URLs will silently fail to load. The “got itself in a mess” message incorrectly slices softErrorMessage, causing it to lose the “Y” in “You”. If you use a macro that creates internal links, such as Leon's custom «replace» macro, then clicking such a link will alter the ID of any previous .passage elements named “undefined” (case-sensitive) - adding a timestamp, which should normally only occur when navigating back to that passage two or more times in a Jonah story. If you highlight a link with separate link text and passage title (such as [[link text|passage]]) then press control-L, a passage named “link text|passage” is created, instead of just “passage”. Due to a naming bug, variables saved via «remember» are unwittingly shared over all Twine stories accessed from the same website (as in, the base hostname, like http://philome.la/) and played in that particular browser - if a remembered variable name in one story matches that of another story, then one will overwrite the other if both are played. In the “create passages” prompt given when you close a passage containing red links, the 'cancel' button behaves identically to the 'no' button - both dismiss the dialog and close the passage. If, for instance, a HTML file was saved from IE, its tags become uppercased. This precludes Twine from importing the HTML via Import Compiled HTML. Saving HTML from IE causes line breaks to be inserted, especially in the storeArea. This can break custom scripts. 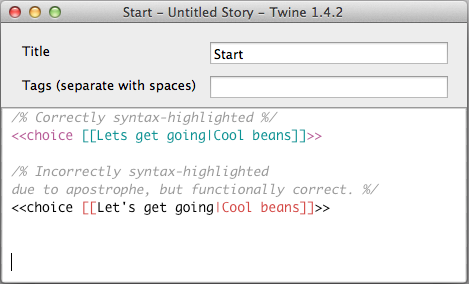 Twine refers to the innerText property to read code from storeArea passage elements, when it ought to use textContent. This causes e.g. multiple spaces in passages to be truncated. The syntax highlighter incorrectly displays link arguments to «choice» macros, whose text contains apostrophes or quote marks, as incorrect. The bookmark link has proved to be a massive perf drain when a story uses JS objects in variables. It should really only be computed when the player actually clicks the link. It has been suggested that visited() should throw an error if the passage name given to it does not exist in the story.